Best Choice Products offers the Best Choice Products 12in Non-Stick Crepe Maker - Black for $21.99 via coupon code DEALMOONCREPE . Features：Enjoy delicious French crepes, Spanish Frisuelos, or fluffy American pancakes in seconds! 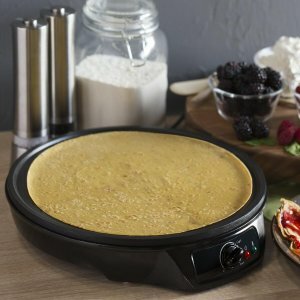 This professional-grade crepe maker gives any amateur cook the ability to make delicious crepes and other breakfast foods with ease. You'll enjoy a perfectly cooked, wafer-thin crepe every time, filled with your favorite savory or sweet ingredients. Learn some new recipes of your own, or gift it to anyone who loves to cook!